The following information was received in an interview with Dorothy Plagge (DMLC ’38) conducted by MLC volunteer archivist Clarice Fastenau. The Lord called Dorothy home to His side on March 1, 2014. 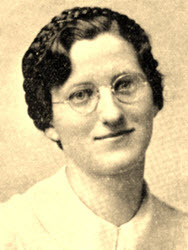 Dorothy attended DMLC from 1931 – 1938, 4 years of high school and 3 of college. Growing up on a farm between Klossner and Lafayette (MN), she was not confirmed until she came to DMLC. Her parents thought it would be easier for her to have the religious courses at DMLC and then be confirmed, which is what happened. She was confirmed after having Catechism in 9th grade with the promise that she would continue at DMLC and have the Bible History course the following year. She stayed with her aunt and uncle at 903 Center St. during her first two high school years. During 11th grade she and her brother Walter stayed in an apartment where she did light housekeeping/cooking for them. Walter didn’t continue after that year, and she stayed with the Herb Sitz family during her 12th grade year and 1st year of college. He was the principal at St. Paul’s then and later became a professor at DMLC. During her 2nd and 3rd years of college she stayed with her aunt and uncle, M/M Henry Plagge, at 1310 N. Minnesota St. Some years she ate lunch at the college 4 noons per week. There were no Wednesday afternoon classes, so she didn’t eat there those days. She remembers “kniep,” molasses/corn syrup to eat on bread. If she brought her lunch, she ate it in the designated area, the band room on the third floor of Old Main. The Recitation Hall, built in 1927, was quite new at this time. Hillcrest (a large house that sat near the present library) was the only girls’ dorm. Dorothy took part in intramural athletics. She remembers wearing stockings and a gym suit/shorts for playing kittenball. She would walk back to campus in the evenings to attend glee club rehearsals and to watch basketball games except when she lived at 1310 N. Minnesota St. That was too long to walk at night. Girls would wear snow pants while walking to church, but they were to take them off in the basement before church. Dorothy kept hers on. Each day started with chapel at 8 a.m. The doors opened 5 minutes before. President Bliefernicht led chapel, reading a devotion from a meditation book. Later President Schweppe did the same. Students had assigned seats for chapel with the younger classes sitting closest to the stage. Boys and girls sat separately. Dorothy was one of the students taking attendance for several years. She recalled that once President Schweppe’s daughter, Betty, was late. Dorothy didn’t mark her tardy, but the next week President Schweppe read Betty’s name with an unexcused absence, and Betty was angry with Dorothy. “Third normal” students played the organ for chapel. There were about 120 students at this time. After graduation she received a contract to teach at a Missouri Synod school in Good Thunder (MN) where she stayed for 7 years. After that she taught in another Missouri Synod school in Waconia (MN) for 3 years. Then she returned home to take care of her sick mother and never returned to teaching. She never married.